This useful book reviews and analyzes the rigorous scientific, regulatory, and clinical testing and evaluation applied to the widely used food additive aspartame. In one compact volume you gain access to extensive information illustrating the increased recognition by regulatory agencies of the usefulness of human studies in evaluating new food additives. 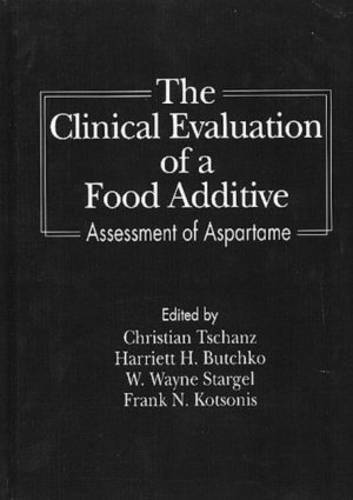 The Clinical Evaluation of a Food Additive: Assessment of Aspartame begins by describing the nuts and bolts of food additive safety evaluation in humans, including an insightful historical perspective of the development of good clinical practice guidelines. It provides the regulatory requirements for human research, as well as key elements for the design and conduct of human studies. The scientific and regulatory considerations of food additive safety are explored, including interesting descriptions of aspartame's key animal safety studies. In addition, the book reviews the medical postmarketing surveillance system developed for identifying and evaluating reports of aspartame's alleged adverse health effects. Through meticulous research and systematic clarity, The Clinical Evaluation of a Food Additive: Assessment of Aspartame provides work-saving, state-of-the-art examples to guide future testing and evaluation of tomorrow's food additives.